Cornerback Adoree’ Jackson, the second of the Titans’ two first-round picks in the 2017 draft, gave home fans a thrill Sunday when he returned a punt 80 yards for an apparent touchdown. A penalty negated the return. Want to add some fun to your NFL experience? 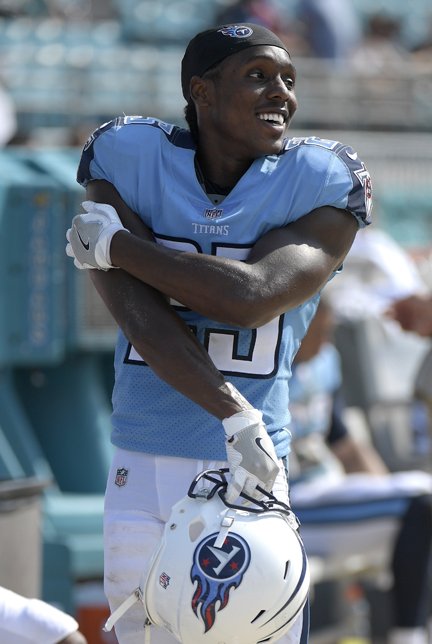 I give you Titans rookie cornerback and punt returner Adoree’ Jackson, who quite honestly is just a kid having fun playing football. He’s the antidote to the hand-wringing of NFL players vs. Trump-said-what? tweets. It showed last week when the rookie from Southern California electrified the crowd with an 80-yard punt return for an apparent touchdown. Yes, it was wiped out by a questionable block-in-the-back penalty by David Fluellen, but it didn’t remove the fact that it was Jackson just out there enjoying the game and his performance. After he broke into the clear, Jackson turned to the Titans sideline and flashed a big grin for about the final 30 yards of his return. It was a smile that didn’t leave his face until he realized that his run was all for naught. “I feel bad for him and us,” Titans coach Mike Mularkey said. But he shouldn’t. Jackson found the silver lining in the play and maintains confidence that a repeat is coming soon, one that will stand. After the game was over and much of the postgame talk had centered on the pre-game goings-on, Jackson still found time to enjoy the moment of his almost-first NFL touchdown. This is actually the second time Jackson has lost a return touchdown to a penalty, though the first was during the preseason. Jackson doesn’t seem worried about that and is confident that there is more where that came from. It also is encouraging that Jackson is quickly learning about life as an NFL cornerback. After a rough preseason baptism by the Bears, Jackson has shown steady improvement in starting the first three games, even holding up well Sunday against Seahawks’ tight end Jimmy Graham, who tried to post him up like a power forward, only to have Jackson recover and knock the ball away. For a Titans return game that has been dormant for years, not to mention a secondary that has been spotty in recent seasons, Jackson’s skills and his approach provide a breath of fresh air at a time, a place and in a situation where that is sorely needed.